Yes, even if you eat some meat, the gourd family of seasonal vegetables will keep the system cool and help cleansing as well. This ridge gourd and lamb mince curry scramble is our way to eat a good meal that tastes rich but is light on the system. We have not been eating meats much in this heat as you don't feel like eating anything heavy. Just some iced teas that I keep having on room temperature too, many yogurt based raw recipes and many sprouts based salads are taken as small meals through the day. 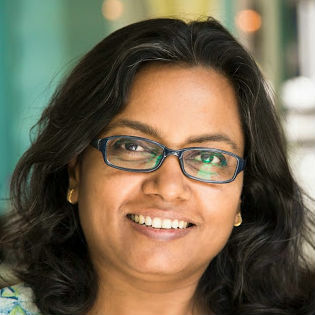 We just can't have 2 or 3 large meals during Indian summers, the way I do in winters instinctively just 2 large meals. It is so draining we need to keep having small refreshing meals throughout the day, even if it is a bowl of cucumber and carrot sticks on my work desk. Ridge gourd is a good source of dietary fiber, both soluble and insoluble type, and is moderately rich in calcium and phosphorous, other minerals are very low. 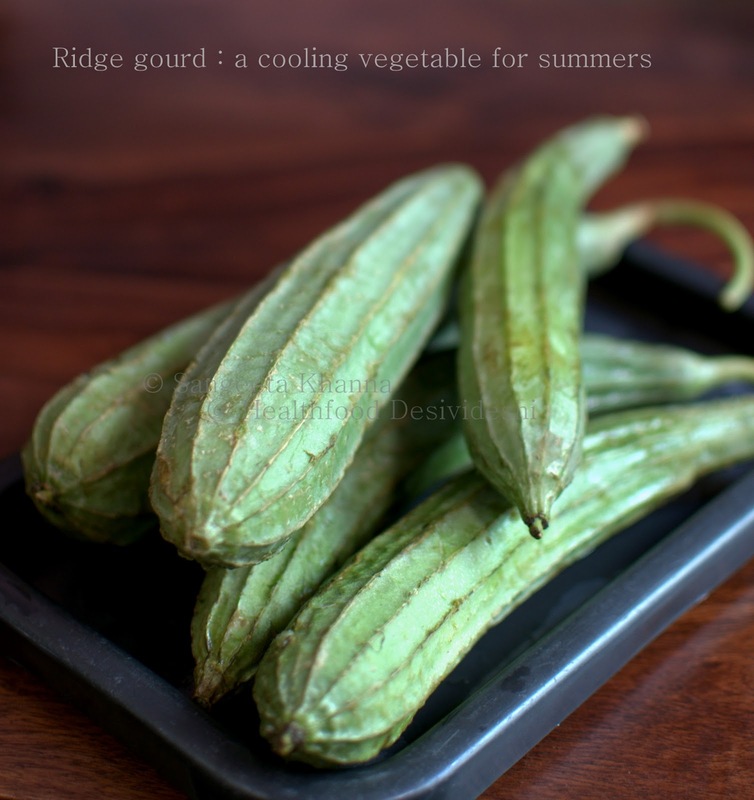 According to Ayurveda it is a cooling and cleansing type vegetable very good for summers. To proceed with this vegetable you need to peel it diligently. The hard edges are peeled off first to remove the wiry veins on the vegetable, then the skin is peeled off using a potato peeler. I would suggest not peeling too deep if the gourd is tender, but if you get only mature gourds you have no option to remover the skin completely. The process is easy once the ridge gourd is cleaned. slice lengthwise first and then cut in semi circles or cubes of required size. Heat oil in a pan, tip in the cumin seeds and wait till they splutter. Add the chopped green chilies, garlic and red onions. Fry for just a minute and add the turmeric powder and chopped ridge gourd. Mix well and add salt too. Keep stirring on medium heat till the ridge gourd starts wilting. Add the mince, and the remaining powdered spices , mix well and cook covered on low heat. Stir after every 5 minutes, adding a little water if required. I never required any water to be added in this curry, you might like it a little thinner, add water in that case. Takes about 25 minutes of simmering to be completely cooked. Take off heat once cooked, adjust seasoning and serve hot with chapatis or plain boiled rice. 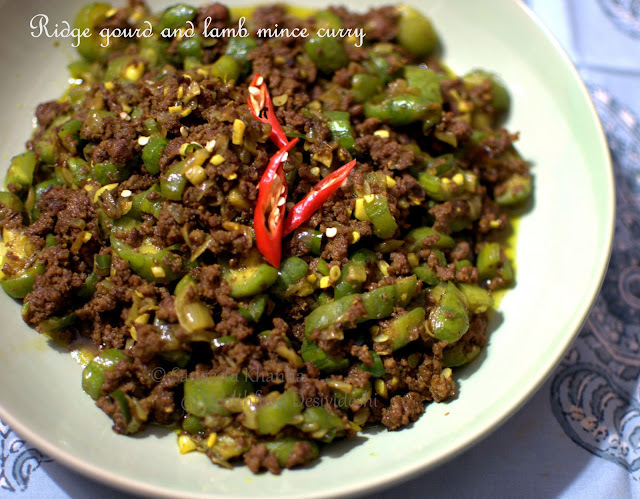 This one is made using lamb mince, the same recipe comes out well with mutton mince as well, you might want adjust the spicing for both. This curry scramble is a nice way to break the monotony of cold summer meals or light khichdi type meals that people mostly prefer. It is spicy, it has meat, very nourishing and still light on the system. Just perfect for summers.